As you may know, the travel writing/blogging community on the internet is a small group - and a great group of fantastic people! One of my favorite travel writers/bloggers is Guido J. van den Elshout - he is one of those critical puzzle pieces, some of the glue that holds us together. Known online as Happy Hotelier, one of his interests is the Hotel Industry. 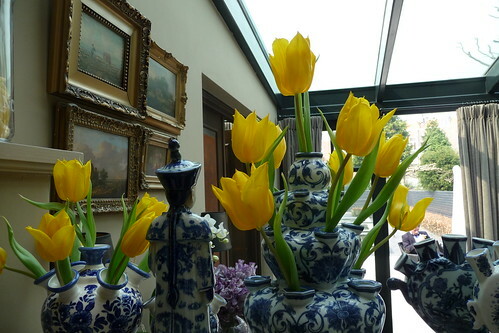 And he should know - he runs an INCREDIBLE 'weekend hotel' - Haagsche Suites, located in The Hague, Amsterdam. Haagsche Suites is an extraordinary luxury hotel - beautifully designed and furnished, with a personal touch that is rare in this world. The first thing you read on his site? "A hotel to come home to!" and I have to say, that perfectly describes this extraordinary hotel. Not only are the suites magnificent, but the services that Guido provides - gardens, breakfasts, personalized check-in, and more - THIS is what the hotel industry should be doing. If more businesses - hotels - looked after their guests in this manner, more people would be traveling - and, dare I say it? The world would be a much happier place. The quiet gardens, luxurious suites, delicious breakfasts, and personalized service all lend themselves to this quiet oasis of gentility. GVdE: It started when we could acquire our neighbor's townhouse, a Siamese Twin to our own house in 2000. We paid too much. The house needed a lot of improvement, as the former owner had lived there for over 60 years without a lot of maintenance. Old leaden water and sewage pipes, an old electricity system (built around the original gas pipes which served the gas illumination as usual in 1890 when The Hague was not electrified yet), no central heating, windows and roof needed replacement and so on and so forth. dream more or less. We put a lift in it and because of that had to alter and add a bit to the structure of the house. We added conservatories to both houses. The one added to our own house serves as a breakfast room for our guests, although it turns out most of our guests are in favor of a breakfast served in their suite. So we created 3 suites, one on each floor of the house. Each is approx 75 Sq m. 2 of them can be used as fully-equipped self catering apartments. All three have a separate sleeping room with double beds and a separate living. The two top ones have a fully equipped kitchen. The whole renovation took until October 2002, when we opened. 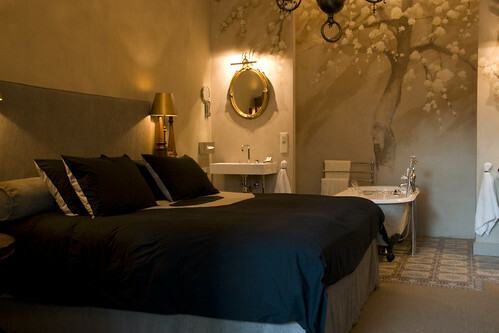 When we were in the planning stage, we had one example - a couple who ran a a similar concept of a very luxe B&B in Haarlem. We asked them for help and advice, which they graciously did. We have a huge garden, which at the time we had laid out as an English cottage style garden with many roses and perennials, no lawn as I hate lawn mowing and the soil is pure sand, as our houses are built on a sandy elevation that eons ago was the coast of Holland and the North sea. The garden we also gave an entire makeover. In addition to the garden, we have a private courtyard where guests can park their vehicles. We're located just outside the center of The Hague - 5 minutes by public transport. We have three tramlines stopping nearby, connecting you with the two train stations of The Hague. Each train station is approx 20 minutes from Amsterdam Schiphol Airport and 30 minutes from Amsterdam Central Station. The Beache of Scheveningen, the main seafront of The Hague, and of Kijkduin are also nearby with public transport. In addition, we offer guests free use of our city bikes and occasionally I help them out as the Limo (well to European standards: A Citroen like the French President uses) driver. For the final touch, we have had help of an interior decorator, mainly because I am more a modern design-loving type than the design the house needed, simply by its' design and the period from which it stems, late 19th century, just before the Dutch Arts and Craft period of which you can can see many examples in The Hague. When we started and searched for a name, the name Haagsche Suites (i.e. Suites of The Hague) came up. I know and knew it is difficult to pronounce in English but stuck to it. Actually the result is something between a luxurious B&B and the suite floor of a luxurious 5* hotel without the cheap rooms and the service equivalent to a 5* hotel, something trendy and many times copied since. Actually B&B is not a correct term I believe, because the guests have their own suites - there are 3 of them and a separate front and back entrance. In the garden, there is no real separation into two separate gardens. We have joined two gardens that are huge according to Dutch standards! We've had parties of over 150 persons without a problem. So Guests of suite 1 share their terrace, the others have separate balconies that can seat 4 to 6 persons. Even now in the lesser economic period, we've see our trade grow. I believe because we offer a rather unique product with excellent service. Seeing our guests being genuinely and pleasantly surprised when we surpass their expectations is our ultimate goal and satisfaction. When we planned it, I had never anticipated that we would become a favorite honeymoon destination. After the wedding celebration, many newlyweds have chosen us for their first honeymoon night. Sometimes they stay both (or one of them) also the night before the wedding. Then the wedding party comes together at our place the next day and together they go on to the ceremony and to the party, while sometimes the bride and groom come to re dress in between or have a little rest. Many wedding celebrations are on the nearby beaches in summer. On an annual basis we have the honour to have 50 to 60 newlywed brides and grooms as our guests. I would say that's a lot, with only 3 suites. Sometimes we have weekends with 6 of them both on Fridays and on Saturdays. 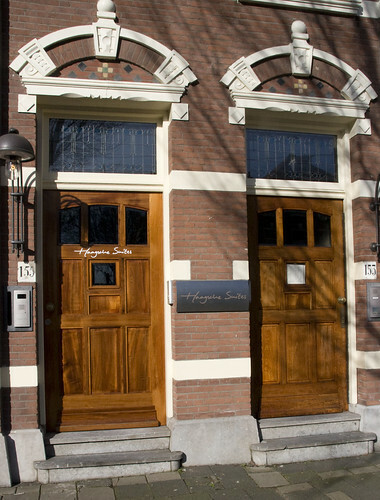 During the week we have several guests who are regulars and who have business in The Hague and stay one, two, or three nights every week or every other week with us. Occasionally we have long stay guests. One couple even stayed 6 months. Sometimes we have guests who stay 5 or 6 nights in one of the top Amsterdam hotels and come for one or two nights to The Hague. I always try to tell everybody that you should sleep in The Hague and (only) party in Amsterdam. Mind you: If you live in Brooklyn or in New Jersey, you won't mind to visit New York for a night's opera. It'll take you 1.5 hrs to travel to Manhattan and 1.5 hr back. From The Hague, you are in the center of Amsterdam within 45 minutes (granted outside traffic hours). WE: Haagsche suites is a Weekend hotel - what does that mean? GVdE: A hotel where you can spend the weekend in. Usually a small, independently (mostly family) owned hotel. It offers personal care, service, and attention. Usually it has a personal touch of design and can be located in a historic building or an unusual building. It can be a small design hotel as well. The site Weekendhotel has a collection of such hotels in The Netherlands, Belgium, and Luxembourg. 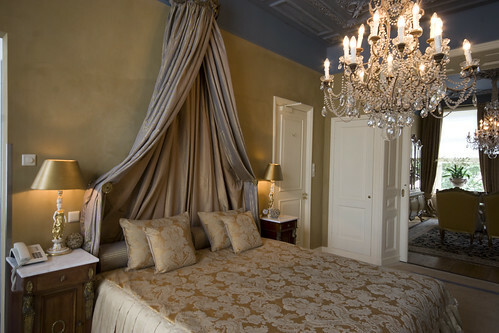 The accommodations vary from simple comfy to over the top Luxury. The number of rooms vary from 2 to 20. Haagsche suites is a weekend hotel but not a family hotel in the sense that we cater to younger children. We do not. However we have had families where the parents celebrated an anniversary or birthday milestone where several family members stayed with us. WE: What restaurants and nearby activities do you recommend for your guests? GVdE: I have a list of 10 to 12 frequently advised restaurants. If you would like Fish, and I would say “City by the Sea,” I am actually referring to Scheveningen. Scheveningen is a part of The Hague, but the residents still consider it as their own town. It has some fine fish restaurants. My two favorites there are Seinpost and Mero. Then I would say: Indonesian food. In the Hague live many people who were born in Indonesia or had worked there and hence some of the finest Indonesian food can be found in The Hague. My favorite is Keraton Damai. There is no restaurant that serves typical Dutch food. Almost any type of food has its own restaurant (The Hague area counts over 600). For a fine Dim Sum, we used to frequent Mandarin Palace. For more European food we tend to recommend: Calla’s, Spijs, and Waterproof. Currently Seinpost and Calla's are dotted with one Michelin Star. Although I'm a sort of night porter, certainly when I'm awaiting a Just Married couple, I'm not much of a bar or nightclub type anymore. There are beachclubs, however, worth a visit for a late party. Hmm...have to check that out. WE: What other activities are available at Haagsche Suites? GVdE: The Hague is a city at a sea and has about every attraction you can think of. No Gym. No swimming pool. Ponder my ponds, I would say and enjoy the quietness in the middle of a city. At the back where the sleeping rooms are and in the Garden, you hardly hear any usual city noise. Parties from 6 to, say, 20 can have a private Brunch, work/training session/meeting (up to 14), lunch, high tea, dinner, wine - or whiskey tasting. Sometimes we have jewelry or fashion parties. Belgian guests understand the concept best: They come from around Antwerp or Brussels, go to their fave Belgian Traiteur first, and take some food and some wine and lock themselves up in one of our suites and enjoy. WE: Thanks so much, Guido. The Haagsche Suites are extraordinary suites - you've done incredible work! I am so impressed and highly recommend them to our readers. All photos courtesy and copyright of Haagsche Suites. Thank YOU very much fo this opportunity to spread the word. The place looks NEAT and CLEAN.